The Hermosa Community Network, the Hermosa Neighborhood Association and En Las Tablas Performing Arts present The Hermosa Festival, a weekend celebration showcasing the culture and beauty of the Hermosa neighborhood. Organizer Jorge Felix spoke to Lawndale Bilingual Newspaper to share what festival goers can expect to see at Hermosa Fest. Lawndale Bilingual Newspaper: What inspired you and your team to create the Hermosa Festival? Jorge Felix: The Hermosa Community Network was born as result of the city remapping. The Hermosa neighborhood, like many other communities in Chicago, was split into four different wards. Now, a traditionally unified community was divided and residents started to see how some sectors of the neighborhood were neglected and receiving less city services. This brought residents to get together and organize demanding the four aldermen working in Hermosa to work together for the community. The Hermosa Festival goal is to bring the community together and forge a unified sense of community. We invite neighbors and friends of Hermosa to come to our beautiful park. Bring the entire family including your pets. Bring your blanket and picnic basket and BBQ and spend a day at Hermosa Park. How will Hermosa Festival showcase the culture and beauty of the neighborhood? The Hermosa Festival is organized by three local organizations, En Las Tablas Performing Arts, Hermosa Neighborhood Association and the Hermosa Community Network. The three organizations called local artists and performers, local and home business owners, local organizations and also friends of Hermosa to showcase their services, arts and products. What can festival goers expect to see? We have a diverse program: art and craft displays; at the stage we will have performers singing and dancing euro folk tunes, Andean music and Caribbean bomba; children activities and acrobats; and pet education workshops and pet costume competition. What do you hope people take away from the festival and from Hermosa neighborhood? The organizers hope for a safe and friendly community celebration and that residents get to meet each other and make new friends. 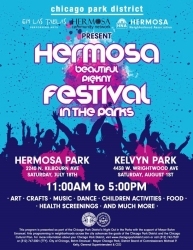 Hermosa Festival is free and will take place July 18th at Hermosa Park, 2240 N. Kilbourn Ave., and August 1st at Kelvyn Park, 4438 W. Wrightwood Ave.